Featuring: Daniel Day-Lewis, Emily Watson, Brian Cox. Director: Jim Sheridan. For those of you that are unaware, Daniel Day-Lewis is the most intense man in the world. His stare would make Chuck Norris wet his pants. He's an insanely talented actor, and when its all said and done he'll go down as one of the greatest of all time. 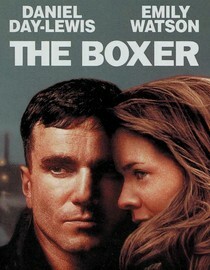 In The Boxer, we find Day-Lewis in one of his more understated roles. While Day-Lewis was spot on as always, the most interesting character in this movie was the political turmoil that affected every single person in the story. I'm not Irish or anything, but I know enough about history to know that the famous luck of the Irish is actually bad luck. The Boxer is set during the period of time when peace was just around the corner in Ireland. After decades of conflict, the Irish were a hardened people that knew nothing but fighting and tragedy and you can imagine the kind of effect that would have on the psyches of Irish citizens. It made them paranoid and led to an odd sort of morality that is reflected in this film. Against this backdrop, we have Daniel Day-Lewis portraying a former IRA fighter, fresh out of jail, looking to make a comeback in boxing after 14 years. I won't spoil the plot, but Day-Lewis ends up in the thick of things. And of course there is a girl, and it is of course complicated. Emily Watson did a wonderful job as the love interest and their unconventional relationship made for some powerful, if subtle, scenes. I shouldn't really have to tell you to watch this movie because you should already know that every single Day-Lewis movie is required viewing here at Netflix Stream. This is yet another interesting film in one of the most interesting film careers in history. Why is it in your queue? Daniel Day-Lewis is an acting god. Is it artsy? No, it's a boxing movie, but it isn't in black and white. What stood out the most to you? The political backdrop of the story. What mood should I be in to watch this movie? For a good fight.